QUEENSLAND'S Sadie Ladies came to Toowoomba today to create a political storm. The Queensland Sadie Ladies turned their attention on Toowoomba to highlight the need to keep water catchments clean, food lands mining-free and lifestyles intact. 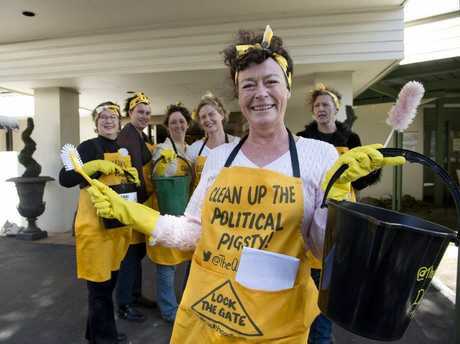 The intrepid "political cleaners'' targeted the State Government hearings examining LNP-proposed legislation that they say takes away ordinary people's rights to object to mining developments. The government's Agriculture, Resources and Environment Committee was in Toowoomba for hearings on the proposed Mineral and Energy Resources (Common Provisions) Bill 2014. The Sadies' spokesperson, Deborah Edwards, said the legislation, if passed, would mean 90 per cent of people would no longer have the right to object to mining in an effort to protect their farms and livelihoods. 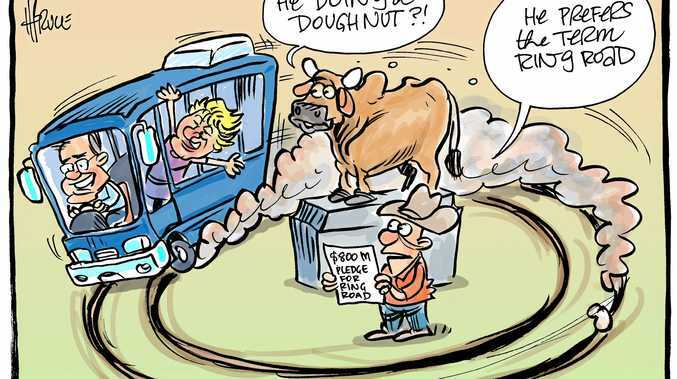 "Toowoomba is the gateway to the Darling Downs, one of Queensland's most important prime food-producing land and it is too precious to throw away to mining companies to make a quick buck," she said. "The Newman government's disdain for clean drinking water is clear since it has allowed Coalbank Ltd to drill exploratory wells in the Wivenhoe Dam catchment, Brisbane's primary drinking water supply, while refusing to rule out the catchment area to mining. "Under proposed changes to the Water Act mining companies will have access to virtually unlimited groundwater. "It appears nowhere is safe from mining and Queensland taxpayers will be left to clean up the mess. "The Sadies believe it's time the people had a say is this. "We want transparency and no dirty deals, so we came here to clean up this place."